One of the rare gems from Bollywood, which although did not become popular with the mass media, it received great critical acclaim globally. 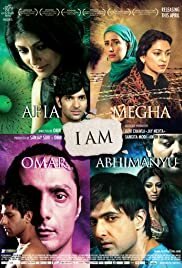 The four stories that are captured in "I Am" bring out pertinent yet seldom spoken-of issues in modern India through four powerful short stories. Nandita Das' solemn character in one of the four stories sheds light on the entrenched sociological issue of placing emphasis on a woman's fertility in marriage. The other story on the historical issue of Kashmir does adequate justice to capturing the barbed-wired realities of the valley, especially thanks to Juhi Chawla & Manisha Koirala's performances. Both Rahul Bose and Sanjay Suri's stories perfectly reflect the repressed silent-treatment that the concerns of homosexuality and domestic child abuse have been constitutionally and systematically suppressed by the Indian state and society.